Do your wedding vendors talk to each other? They should! 1. How many times has someone showed you their wedding video? 2. How many times has someone showed you their wedding pictures? The answer to the first question is quite often “never” – or very VERY few times. The answer to the second question is often something like “a LOT!” – Videos are awesome, but they do require a larger time commitment than pictures. You can see a picture in the blink of an eye, while a video will require a few minutes. So, in general, most wedding videos are shown maybe a few times in the days following the wedding, while wedding photos are shared over and over for years to come. But still – wedding videos ARE pretty awesome! If you want one, then you should absolutely have one (and we happen to know some people who do AMAZING work, we can give you their info if you want). But you should be sure you know what you are getting – and how it will impact your wedding. We have done a LOT of weddings. We have worked with several videographers. Most are great people and they do great work. But then…. Well, not EVERYONE is great. Some have a very “focused” view of what they are doing on the wedding day. My wife and I are wedding photographers (obviously), when you hire us, we become part of your wedding team. That team is made up of your wedding party (Maid of Honor & Best Man particularly), the officiant, the caterer, the baker, the florist, the coordinator, the DJ, the florist, etc. We are all part of your team – you and your fiancé are the team captains. The team has, essentially, ONE JOB for the wedding day. To do everything we can to make YOUR day awesome. The day isn’t about us – it’s about YOU!! Our job is to make your day awesome, and we have to work together to do that. Each member HAS to understand how what we do for the bride and groom impact what the other team members are trying to do for the bride and groom. 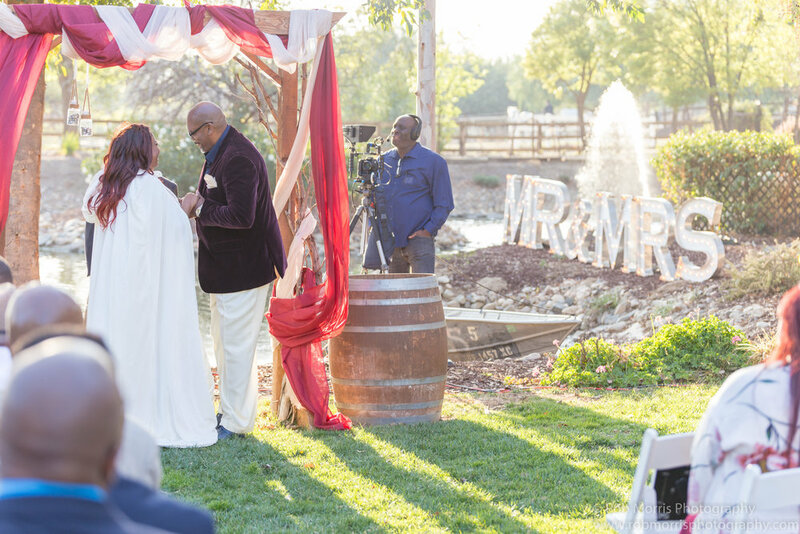 Frequently, we have to make adjustments and compromises to ensure each and every team member can do what they need to do for the bride and groom. It almost always goes off without a hitch. The bride and groom are almost never aware of any compromises that needed to be made – everything goes just fine. On the rare occasion that it DOESN’T go fine, it may be aggravating for the team members involved, but even then the bride and groom don’t need to hear about it. We team members just adapt and overcome the situation and get the job done. It’s our job on the team. As long as every team member keeps the underlying rule in mind – THIS DAY IS ABOUT THE BRIDE AND GROOM – then even annoying compromises are no big deal. But every once in a while we end up with a member of the team who doesn’t seem to care how what they are doing will impact what other team members are doing. We recently did a wedding where the bride and groom had hired a video crew. Not just a videographer, but an entire crew. This crew had awesome gear – it looked like they setup to film a movie – and THAT was the issue. During the ceremony, they had four STATIONARY cameramen. One at the rear of the ceremony area, one on each side, and one setup slightly to the side behind the altar area. This meant that virtually every shot we got of the wedding ceremony had a giant, ugly camera, tripod in it (not to mention the camera operator). Some of the best shots we get at each ceremony – some of the shots that the brides end up loving the best, are shots of the bride and groom at the altar, where you can see their friends and family looking on and loving the moment. At this particular ceremony, this particular shot was impossible to get. Not to mention shots from several other angles were out as well. In the shot above, you can see one of the cameramen in question. Now, he’s just doing the job he was hired to do. Whoever was in charge of their company told him to setup there, and that decision ruined a lot of great shots. In the shot below, you can see a similar shot from a similar angle – at the exact same venue, but this time without a cameraman in the way! There were other issues with the cameramen – such as putting their gear bags in places that ruined shots, having their vehicles parked in areas that would ruin shots, etc. I am sure they made sure all their shots were free of the distractions they created! But the pictures – the things that get shared FAR more than the video – they suffered. In most cases, we are made aware of the videographer well before the ceremony, in ALL cases (except this one) the videographer speaks with us before the ceremony so we can work out a quick game plan to try and stay out of each other’s shots so we can all work towards our goal of getting awesome work for the bride and groom. In most cases it’s just one videographer (and possibly an assistant). This videography company never spoke to us. Not once. They didn’t ask us what angles we might need or want open, they didn’t ask us what our game plan was, they didn’t tell us what angles they would prefer us to try and avoid in order to help their shots, they didn’t tell us THEIR game plan. Nothing. They didn’t try and work with us to make sure the bride and groom got awesome results from photography AND video. When I tried to speak to them, they kind of blew me off. Seriously. They focused ONLY on what they were doing, and as a result, the video and pictures didn’t come out as good as they could have – as good as they SHOULD have! My point is that you should make sure your vendors (those you hire to ensure that your day is awesome) understand that they have to work with the other vendors for the day. NONE of us are more important than the others. On your wedding day, there are only TWO important people present; you and your fiancé. The vendors should communicate with each other; they should be committed to working together to make your day awesome! And IF you hire a videographer, you should INSIST that your photographer and videographer communicate together! It will help to ensure that every part of your big day goes perfectly. You DESERVE it! Should you ask your photographer what camera they use? Sure, why not.... but should you really care? YOU are invited to the Temecula Coach House Bridal Show on Feb 4th! YOU are invited to the Temecula CoachHouse Bridal Show!! If you have a wedding coming up, you have likely dreamed of this day for a LONG time! This is the "big day," it is the most magical day of your life...you want it to be perfect. You DESERVE a perfect and magical wedding! The Temecula Coach House can help you get just that! Visit on of SoCal's most beautiful wedding venues, located in the Inland Empires stunning wine country! You can tour the venue, meet potential vendors for your wedding, eat good food and watch the Super Bowl! They will have DJ's, caterers, officiants, florists, hair & makeup experts, health & beauty products, photographers (of course WE will be there!) and pretty much anything you could need to plan your fantasy wedding! There is, of course, NO OBLIGATION! Come visit, enjoy the venue, enjoy the food, enjoy the people and the beautiful day! Again, the show is at The Temecula Coach House (39900 Berenda Rd. Temecula Ca. 92591), Sunday Feb 4th, from 12-4pm. EVERYONE is welcome, so feel free to share this with anyone you know who needs ANYTHING for their wedding! We truly hope to see you there! Bridal Shoots - where the fantasy becomes reality! Every bride wants and deserves amazing shots of herself where she looks like a princess right out of a fairy tale - unfortunately, most weddings don't allow the opportunity for that to happen. We can help! Weddings - they are just amazing, and unexpected moments like this are just one reason my wife and I love being wedding photographers! We do still have dates available in 2018, so if you need a wedding photographer, please don't hesitate to contact us! Our prices start at $1200 and that includes a free engagement shoot, TWO photographers on your wedding day, and a free engagement shoot every year! Its located at 46880 Rainbow Canyon Rd, Temecula, CA 92592 and goes until 4pm today. We hope to see ya here! Do your bridal pictures look like this? You’ve seen bridal pictures before – amazing, jaw dropping works of epic art. Scenes that seem straight out of a fairy tale, perfect moments in a perfect location. Hair and makeup perfect, everything lit just right – these amazing images are what most brides to be are bombarded with as they head toward their wedding. You see them in bridal magazines, wedding websites, television commercials – even in movies. You can’t help it – you want them too, and why not? They ARE beautiful! You want them, and you just assume you will get them. Be honest now… did you? I am not talking about all the pictures of your wedding day. I am talking about pictures of just the bride (maybe a few with the groom) looking and feeling like a supermodel with amazing pictures that stun and amaze all who see them. A bride in her beautiful dress sitting on an amazing couch looking confidently into the camera, a bride in her bridal robe looking thoughtful and angelic with the wedding dress not on but in the picture. C’mon, admit it – they are AMAZING pictures that you wanted. So… did ya get em? Probably not. Now, it’s not your wedding photographers fault. You most likely got the absolutely best possible pictures of your wedding day, and they are probably beautiful, and you are probably justifiably thrilled with what you did get. But the pictures of the bride…. They are known as a “bridal session” – and, 99% of the time, an amazing bridal session is just not possible on the actual wedding day. On your wedding day, there is just too much going on. Too many people running around trying to make sure everything is perfect. Let’s talk about the room you actually get ready in. It will probably be pretty small. Movies like to show brides getting ready in large beautiful rooms – but the reality is the rooms are usually very small, they have TERRIBLE lighting, and they are filled with the bride, bridal party, hair stylist, makeup artist and all the items those people bring with them (shoes, clothes, purses, cell phones, drinks, food, etc.) so this small, poorly lit, crowded room is also VERY cluttered. That doesn’t make for good pictures. Let’s not forget – you are getting ready for an ACTUAL wedding! There is just SO much to do on your wedding day, not to mention that almost NO wedding ever runs on time – they almost always seem to be running late. Most photographers will agree the area that almost ALWAYS suffers time cuts and rushing is the pictures, the formal pictures with the entire bridal party and family. We all want 45 minutes or even an hour, but the reality is we usually struggle to even get 30 minutes. So, on your wedding day, there is just no good location to do a bridal session, and there is no time to do one. But you DID see all those amazing pictures… so what gives? I’m gonna let you in on a little secret…. They fake it! They DON’T do it on the wedding day! A good bridal session requires time, a good amount of it. It also requires an uncluttered room, amazing lighting – and as few people around as possible. It’s just not possible to do this on a wedding day – obviously the actual wedding takes priority (rightly so) on the wedding day. So, for a bridal session, we arrange for the bride to meet up with us at a location we all choose together, and we do it like 2-3 weeks before or after the wedding! We DON’T do it on the wedding day! We bring in a hair stylist and a makeup artist and spend about 2 hours treating the bride like a super model (in a GOOD way, lol!) – we then have the time to make sure the lighting is PERFECT, we make sure the location is BEAUTIFUL (no clutter to be found). We spend time teaching the bride how to pose (if needed) so that she actually looks like a princess straight out of a Disney fairy tale! Doing it this way, we can take the time to make sure these pictures are PERFECT – that they are everything you have been dreaming about! We give our brides works of art that they will love and cherish forever. But there’s another problem. Bridal sessions aren’t really a “thing” here in Southern California. They are quite common and popular in the Midwest region of America, but for some reason no one seems to do them here in SoCal. 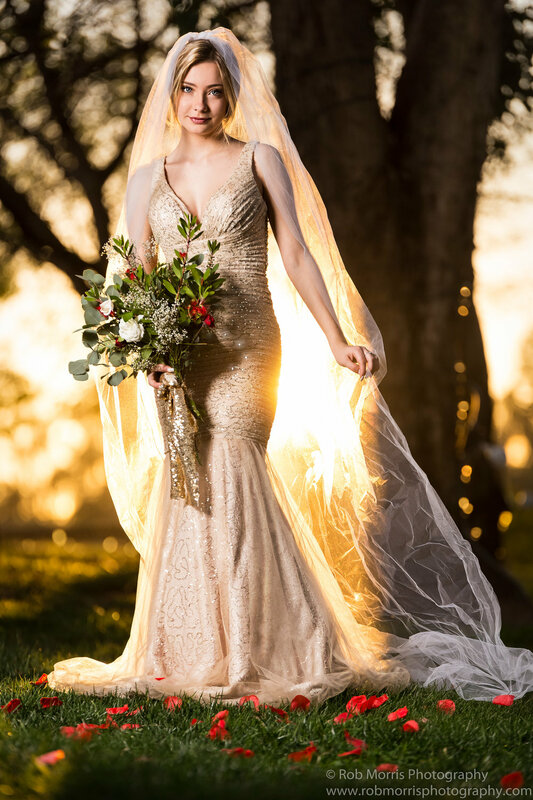 Well, WE think SoCal brides are the most beautiful brides there are, and they SHOULD have access to amazing bridal pictures that you can ONLY get from a controlled bridal session! So we DO offer bridal sessions. I am not sure if we are the ONLY wedding photographers in SoCal that do this (I personally don’t know of any others that do), but at the very least we are among the very few who do! We offer a bridal session as part of our deluxe wedding collection (which is already lower that every SoCal wedding photographers that I know of) at no extra charge. So if you go with us, and pick that collection, then you automatically get one. The full deal – hair, makeup, lighting, location – the works. But what if we are NOT your wedding photographer? What if your wedding has ALREADY taken place? Are you out of luck? Nope! We can still help you! We can simply do the bridal session for you. All you need is your wedding dress (or get a wedding dress that you want to be photographed in), and the desire to be in amazing works of art where you look like a supermodel/princess! If you have already booked a wedding photographer, that’s fine – you can still hire us for a bridal shoot. If you already got married, you can still hire us to do a bridal session for you! We will make you look and feel beautiful, we will create works of art that you will LOVE forever! We offer a bridal session (usually about 2 hours) where we bring in a hair stylist, makeup artist and we (you and us) decide on an AMAZING location. We go all out on lighting and posing and create images that will become family treasures! You get all the images on disc PLUS a 16x20 print of your favorite image from the session (additional prints are also available)! All of this for $400! So if you are interested in this – PLEASE contact us so we can start setting something up! So, this is my dog Sally. I love her – a lot. She is my favorite dog that I have ever had – bar none… and I have had many dogs and I have loved them all. But Sally has been special. We got her over 10 years ago, we found her at the animal shelter in Hemet, CA. We were living in Perris and we already had a dog named “Mop” and we decided to get Mop a friend. So we went to the shelter to see what dogs were available. For whatever reason, I have always been partial to small breed dogs, and we did live in a fairly small apartment – so we were really only looking at small dogs. There weren’t actually that many to choose from. We saw Sally sitting in one of the pens, with a larger dog. Sally, at that point, was literally sitting in her own poo. But she was kinda cute, so we asked to spend a few minutes with her (obviously, her name wasn’t “Sally” at this point). The Hemet shelter had a small, grassy “play area” where you could spend time with an animal to try and ensure a better fit between humans and animal. So we took her to the play area and…. well, really nothing. She seemed more interested in sniffing around and exploring the area. My wife wasn’t too impressed, she wasn’t very interested. In all honesty, I didn’t want another dog at the time, but I knew my family did – and that was important to me. But it was kind of hot, and I wanted to go home. So I started pointing out that this was probably a little overwhelming for Sally. She was pretty much living in her little pen, but strange humans show up and she is taken out of her pen and put into an area that she had probably never been in before. My wife agreed, but still seemed hesitant. Sally was showing very little energy, very little personality – kind of nothing. But my wife picked up a tennis ball and threw it over near where Sally was, and Sally kind of came to life. She quickly ran after the ball and grabbed it and started to play a bit. That was enough for my wife, so we decided to take her. We signed the papers, paid the fees and Sally was ours. They were unable to tell us much about her other than she was dropped off because she wasn’t housebroken (which turned out to be VERY untrue). They couldn’t even tell us how old she was. They estimated that she was probably about 1.5 – 2 years old, but admitted that they were pretty much just guessing. On the drive home, Sally really started to bond with my wife, Natalie. Sally kept resting her head on Natalie’s shoulder, trying to make frequent eye contact with Nat, and giving lots of “doggie kisses.” When we got home, Sally explored her new home – and got to know our other dog, Mop. She also started to bond with my oldest son Zakk (Zakk is STILL one of Sally’s favorite human beings on the planet). But I noticed that Sally was skittish – VERY skittish. She seemed scared of everything. She also seemed terrified of adult males (we suspect she was abused, but we have no way of knowing that for certain). So that was a problem for me – I can’t stand skittish dogs. So I didn’t like Sally very much. I wasn’t mean to her, I helped take care of her, I showed her affection – but we weren’t very close. I was an adult male and she was a skittish dog, so we basically tended to stay away from each other. But she never tried to bite me, she allowed me to pet her – we were “civil” to each other. Oh, and we let our youngest son, Josh, name her – for whatever reason he really liked the name “Sally” – so that became her new name. I do sometimes wonder what name she had before that, but there’s no way of knowing. Over the years, we eventually had to get rid of Mop (don’t worry, we found him a VERY good home), but for various reasons – mainly that my wife had become very attached to her – we kept Sally. We moved a few times, and at some point, I realized that I had become quite fond of Sally. She was very friendly, she was very affectionate, she liked to play, she is just a great dog! When one of us wasn’t feeling well, Sally just seemed to know, and she would lay down next to whoever wasn’t feeling well and just tried to “be there” for us. Let’s face it, a dog can’t do much for ya when you’re sick, but she did what she could. Also, we are “those” people – we let our dogs sleep in the bed with us. We had a Samsung TV that would make a short melodic beep when we turned it off to go to bed. Sally quickly started associating that sound with bed-time, and (for some reason) would get VERY excited when it was time to go to bed. We eventually got a better tv and put the old tv in our bedroom, and the first time we turned the tv off in our room it was kind of funny. Sally heard the “go to bed” noise….but we were ALREADY in bed. She was very confused, and it was cute. But anyway, I had become quite fond of Sally, and somehow, we had become quite close. At one point she seemed like she was starting to get “old” to me. I was worried that she didn’t have much longer – we never knew exactly how old she was, and we had already had her for quite some time, so I thought she was on her way out. So I wanted her remaining days to be as nice as possible. So I started deliberately and consciously “spoiling” her. We all did. We started giving her more affection; we started buying her toys and treats, and just trying to “be there” for her – like she had done for us countless times. It turns out that she was just not feeling well, she did eventually get better….but we kept spoiling her (lol we STILL spoil her!) I think, as a result of all of this, Sally and I have become VERY close. I spoil her as much as I possibly can. Well, in addition to being quite old (for a dog), she has now pretty much gone blind, and has diabetes. She doesn’t seem to be in any pain or discomfort – she still seems happy. She can’t jump up on our bed anymore – it’s too high – so, at bed time, I pick her up and put her on the bed. But from our room, it is possible for her to get into the back yard. At night, when a squirrel or something is in the back yard, Sally feels it is her duty to chase it off… so she jumps off the bed and goes to work. But then she can’t get back on the bed. So I set up two pillows on the ground next to our bed. One has a pillow case, and I put a heating pad inside. The other is just a bare pillow. So if she is cold, she can lay down on the warm pillow, if she’s not cold she just lays down on the other pillow. I do things like that for her. She’s a member of our family and I care for her very much. Time seems to be catching up with her, and I am fairly certain she doesn’t have much longer (I kind of hope I am wrong again). But her remaining days will be filled with love and as much happiness as we can possibly give her! Anyway, I just wanted to post this as kind of a tribute to the best dog I have ever had! Doing a bridal portrait shoot today - cant wait to share the pictures! Anyway, the temperature seems to be lower. I say "seems" because, yes, the thermometers are reading slightly lower temps then we have had (we had a day this summer that was 120!!!!! ), but it's hard to tell because summer has left a parting gift: humidity! I don't know how it is where you are, but here at my place it is currently 78% humidity. I guess it wouldn't be so bad, but (of course), my air conditioner broke. A moment of silence please.... My A/C has worked like a champ all summer! Dutifully pumping out nice cool air like it was piped directly from Santa's freezer! Yeah, we ran our A/C a lot - I am sure we bought the people at the electric company a nice vacation home in the Bahamas, but it was worth it (remember, 120 degrees!!!!!) But now, our frigid guardian has apparently blown his last gust of cool paradise. I suspect the sun has noticed this untimely demise and decided to ask his good friend humidity (also known as Satan's girlfriend!) to come and stay at my place! Now, we do have access to a swimming pool - but.... ya see, we live in an apartment complex. It's a nice one. Heck, I LOVE it here! But that means it's a communal pool - and, well, well I just don't like the idea of swimming in other people's urine. Not that I want to swim in MY urine either, but - well, you know what I mean! So it's hot and miserable at my place right now - and ya know what's weird? I find myself mostly worried about my dogs lol! One of my dogs, Sally, is kind of old. I don't think she has much longer. I worry that it's too hot for Sally! I am dripping sweat, and trying to point fans at my elderly dog lol! I dunno, maybe the heat has fried my brain! So, no real point to all of this other than this - it's hot, so how do I make sure my old dog is comfortable? Does your wedding photographer like weddings? So, as a wedding photographer, I always want to get better! There is no point at which a serious wedding photographer (or ANY type of photographer) should say “Yep, I’m as good as I need to get, I don’t need to learn anything else.” That should NEVER happen! There are always new things to learn – there are always skills that can be refined and improved…there’s always SOMETHING! So, one of the things I do to learn new things is watch YouTube tutorials and related videos. But sometimes you learn something that you wish you didn’t – or maybe it would be more accurate in this case to say that sometimes you are reminded of something you wish you didn’t know. I was watching a tutorial and the photographer talked about taking pictures for “filler.” His quote was something along the lines of “you have to deliver like 300-400 pictures, so take filler shots so you can have that many to deliver.” He sounded so blasé and downright bored while he said it! I couldn’t believe it – filler shots?!?!?!? The concept of filler (in this context) is simply things to fill empty space. In other words, this photographer was suggesting that people should take shots no one is going to want JUST so he got the number of pictures he felt he needed to deliver. Now, think about that – imagine this photographer at YOUR wedding! Wedding photography is expensive – there is no way around it, no sugar coating it. It’s expensive. Now, it’s actually justifiably expensive, wedding photographers work HARD, and they work LONG hours – and the work that goes into photographing a single wedding goes FAR beyond the actual wedding day. So yes, there are reasons for the high cost – but “filler” shots are not among those reasons! So, imagine this is your wedding – you have paid a lot of money to have the photographer show up and take pictures… how many filler shots did you want to pay for? Don’t you want your photographer to try to take shots YOU want EVERY TIME HE TAKES A PICTURE?? The goal of most wedding photographers is to make every shot as amazing as possible. But yes, some shots are just fairly mundane by nature. We need to get shots of the center pieces on the tables, for example. We usually don’t have much time to do it, either – and, let’s be honest – it’s a center piece! It’s not going to be an incredible shot by default (how many pictures of center pieces have you just been blown away by?) But, as a wedding photographer, I want each shot to be as incredible as it can be. So for a centerpiece, I will find the best light, find the best angle and make the shot the best possible shot. The concept of “filler” just shouldn’t exist to a wedding photographer. Each shot should be deliberate – each shot should matter! For my weddings, I have a target amount – I aim to get 1000 shots for the bride. But it’s just a goal. Sometimes I go WELL above that number, sometimes I actually come in under that number. But each and every shot I deliver will be a shot I put thought and effort into – they will ALL be shots I am proud of – they will ALL be shots I think the bride and groom will love! I don’t think “well, I better take that picture just to make sure I have enough.” And your photographer shouldn’t either! You pay too much money to get filler! Make sure your wedding photographer actually likes what they do. Make sure they actually like weddings. Make sure your wedding photographer actually wants to be at your wedding! Your wedding is special to you, it should be special to your photographer as well! Headshots. Actors need em, so do singers, dancers - pretty much if you are an entertainer of ANY kind, you need incredible headshots! Your headshot is basically your business card. IT is how you will get that big audition. You can't show the casting director how amazing you are if they won't give you a chance, and a great headshot will get you that chance! Get the Senior Portrait YOU want! Senior portraits. Every year, a new batch of students gets ready to finish high school, they are ready to go out and take on the world! They are just about done with this monumental task we call high school - they have worked very VERY hard, and are excited to start the next part of their adventure. This is a unique time in their life, you can almost literally see their excitement and ambition in their eyes. You can hear in their voice, notice it in their walk - it's pretty amazing! Part of this years events will be the senior portait. A moment caught in time, a snapshot of a time never to be repeated. A memory to have and hold forever. So why are the senior portraits always so awful? Most high schools provide a chance to get a senior portrait done. But they are assembly line, cookie cutter affairs that churn out dozens and dozens of the exact same picture. Photographers often refer to photography like this as "step and repeats." A person steps in front the camera, the picture is taken, they walk away, another person steps up, and repeat. The lights are the same for each picture, the pose is the same, the expression is the same - they are THE SAME PICTURE. Over and over again. Nothing is done to highlight the uniqueness and individuality of each person. Nothing is done to show their personality. No effort is made to bring out the excitement they are feeling. Nothing. It's not really the photographers fault - the situation just doesn't allow for them to take the time needed to really show something about the person they are photographing. But it's not hopeless - most highschools will allow you to hire your OWN photographer and go do your OWN shoot. As long as the photographer knows the criteria the highschool needs followed, you can get amazing photos that show something about YOU! They can be unique to YOU, they can be YOUR pictures! You can pick a location that YOU like and get pictures that YOU like! And even if the school doesn't allow that (but most do! ), you can still get your own pictures to remember this time in your life. Even if they don't appear in the yearbook (and, again, most highschools WILL allow you to do this! ), you can still have images that celebrate this time in your life - pictures that NO ONE else has! Pictures that they will wish they had, but YOU will ACTUALLY have them! We can help you! We can work with you to create a shoot that showcases YOU as a person, that shows how amazing YOU are! Pictures that you will love, images that you will be excited to share in the Internet! Shots that you will WANT hanging on your wall! And again, these will be unique to YOU! YOU will help us to create the perfect photoshoot for YOU! Our prices start at $150 - $150 for images you will love, that your family will love! Contact us soon though, our spots are filling up fast - and ALL highschools have a certain deadline you have to have your shots submitted by. So contact us today so we can create some amazing images that show how amazing YOU are! What kind of engagement pictures do you want? Your engagement shoot - it's important. From this shoot you can get pictures you might use at your actual wedding, you can get pictures to use as your "save the date" cards, you get pictures that you will treasure forever, They are typically very fun shoots - you don't have the pressure of the wedding day intruding on the shoot, the only people typically there are the engaged couple, the photographer and maybe an assistant. It's just usually a fantastic day that provides fantastic memories in a tangible way! But your engagement shoot is important! You have found the person you are going to spend the rest of your life with, and now you get to announce that to the entire world! This shoot should be special, it should be amazing! They should reflect the magic and emotion of your romance - they should show your friends and family WHY you two are getting married, WHY you belong together! So that involves some thought and preparation. First, you need a professional photographer. Yes, again, I am a professional photographer, so yes I am biased. But a friend with a camera may get a lucky shot or two, but a professional photographer knows which angle to shoot from, knows where the sun should be - a professional photographer has DONE this before - they will get ALL the shots! They know how to do this, they know how to catch the moments that happen - even when you might miss it or just weren't expecting it. At a recent shoot, I asked the bride to "pop her hip out" in order to get a more feminine pose for the shot we were doing. She wasn't sure what I meant, and without warning, her fiance popped his hip out and said "like this!" - it was hilarious, it was great and everyone laughed (yes, even the fiance). But him actually popping his hip out was so unexpected, and it happened so fast - it was gone in an instant. But ya know what? I got it. Perfectly exposed, perfectly shot - I got that picture for them. That little fun moment is theirs forever. There were many other moments like that at this shoot, as there are at EVERY engagement shoot. A friend with a camera may get lucky and catch a moment like that for you, but the shot (if they are lucky enough to get it at all) will likely be blurry and poorly exposed. You also need to know what YOU want. This is YOUR engagement shoot! Look around on the internet, look around on pinterest. What sort of pictures do YOU like. And why? What is it about the pictures that you like? The pose? The location? The items in the picture? Pick the images apart and figure out WHY you like them, and tell your photographer! The photographer is there to get the images YOU want - but you need to make sure they know and understand WHAT you want! Don't worry, you don't have to come up with each and every pose - chances are if you show your photographer a few images you want and explain why you like them, your photographer will get a feel for what you are after and will be able to direct the shoot from there. You need to know your area. Not every detail or hidden spot. Just what type of area you are in. If you are in an area that has no cornfields, it might be difficult to do a shoot in a cornfield. But even that doesn't have to rule that concept out - if you like the cornfield vibe, maybe there is something in your area that can serve as a substitute. Things like that. Don't be afraid of props! But they should be YOUR props! Your photographer may or may not have items they can bring to the shoot - but those props won't mean much to you. Think about the items that mean something to you and your fiance. Items that hold special significance, items that have deep sentimental value. It doesn't have to be a diamond studded necklace either - maybe you and your fiance go to a lot of movies and you have been saving the ticket stubs - bring them! You can incorporate those into a few of the pictures. Remember, I mentioned that these pictures should show your friends and family why you are getting married? This is a great way of doing it! Use items from you and your fiance's' life together so far to tell the story of you! It doesn't matter what other people might think of the props themselves, or if they even "get it" - tell your story, and those you care about will either already know, or give you the chance to explain the story to them - which can be another fantastic moment for you! So please consider us for your engagement shoot, but even if you go with another photographer, we hope you have a very special engagement shoot and an AMAZING life! Senior Portraits - When should you get yours? Senior portraits - I love taking these. This is the time when a person has just completed a massive task - they finished school! It's a huge achievement! Either high school, college, post-grad, trade school - whatever - it's HUGE! They have worked really hard and have been rewarded with success. Now they look to the future with a full tank of confidence - they are prepared for whatever comes and are ready for the next big adventure! Getting to capture them at this time is a great experience - they have so much excitement that they can barely contain it and it comes out in the pictures. This is definitely a time they (and their families) will want to remember! But do you HAVE to wait till you have officially finished? No! You can literally get these pictures done whenever you want! If you are looking to get this picture in a yearbook, all you have to do is get them done before the deadline. But you can pick the time of the year you like best to get them done. Do you like the bright sunny mood of summer? Then get your pictures done in the summer before the deadline. Are you a fan of fall? Same thing. All you have to do is get them done BEFORE the deadline for your particular school (and every school is different) and you are good to go! Right now is spring time - the world is coming alive, green trees and grass, flowers opening - it's an incredible time that most people love! If you want senior portraits at this time of year (or any time of year), well - they are your pictures! Contact your photographer now and tell them what YOU want and they will be happy to help you! Obviously, we would LOVE to take your senior portraits for you, and our prices start at $150 for a full session. We can do all styles - the traditional to the more edgy - it's YOUR call (again, they are your pictures) and we would LOVE to help you get the pictures you want! Please visit our webpage at www.robmorrisphotography.com to see more of our work and for more information. And whatever photographer you go with, we wish you a long and happy life! Your wedding - one corner you SHOULDN'T cut! Weddings. These are pretty momentous occasions – absolutely HUGE events in people’s lives. Friends get to watch someone they know and love make one of the biggest life changes they can possibly make. Parents get to watch their children make one of the most significant steps to adulthood imaginable. The bride and groom are joining their lives together – pledging before the world their love and commitment to this person. It’s HUGE! And yet, some would advise that on this life changing day, you should cut a corner in one of the only areas that will last the rest of the bride and groom's lives. Yeah, I am a photographer, so of course you could say I am biased… But think about it: actual memories fade notoriously fast! The dress (which likely cost several hundred dollars – maybe more!) will probably go in a box never to be worn again – or at best to be given to a daughter. Some grooms wear tuxedos – but almost NO grooms actually buy the tuxedo. It will go back to the rental shop. The gifts fade into everyday life, eventually to wear out, break or simply get replaced. The food gets eaten that day and is gone – the cake… well MAYBE you save a piece and eat it on the first anniversary, but then even it is gone. Other than the marriage itself, only the pictures last! They are forever. And THIS is the area that people suggest you cut corners on?? You spend hundreds, if not THOUSANDS of hours planning the wedding – down to the tiniest detail! You go through an incredible amount of effort to get the day just the way you want it – but (and trust me) it will go by so fast and furious that by THE NEXT DAY, much of your memories will be a blur. And they don’t get clearer with time – they fade even more. But this is likely your only time being involved with a wedding at this level. But what about your photographer? If you have a friend, even a friend with a “nice camera,” how many weddings have they been involved with? Do they know what to expect? Where to stand and when to stand there? Do they know those little moments to watch for? Those moments that will mean so much to you over the years to come? Probably not. Photographing a wedding is NOTHING like just being at a wedding. A professional wedding photographer has done this – a lot. They have seen this over and over again. They know what they are doing. They know when to catch that shot of your dad getting emotional (when he thinks no one is watching!) – they know what you and your new spouse are going to do minutes after you are pronounced married and walk off back down the aisle (no, not THAT lol) – YOU probably don’t know, but the professional photographer does, because they have seen it many times… trust me, those moments are very beautiful and magical, and you WANT those images! Your friend with a camera probably hasn’t really even thought about it. You probably won’t get told to have your friend with a nice oven buy a cake mix and bake you a cake. It’s unlikely that anyone will offer you the advice to get a friend who happens to have a sewing machine make your dress. I doubt anyone will suggest having a family member whip up some sandwiches for the reception dinner. No, you go all out in these areas. You go as big as your budget will allow, because you want this day to be PERFECT… but you’re not going to remember most of it. I promise! The day will go by in a blur of action. It will be over before you know it, and the memories you DO have will fade. Quickly. The pictures are what will last. They will remind you of the details you forget over time. They will be what you have to see the moments you missed in the first place – you can’t be EVERYWHERE on your wedding day, you can’t see EVERYTHING on your wedding day. But the pictures can show you what you missed, what you forgot. The pictures will last for the rest of your life! Don’t you want the pictures to be amazing? Weddings venues are famous for their bad light. A professional wedding photographer knows how to deal with that. People move – often. Your friend with a nice camera will likely deliver you a lot of poorly lit, dark and blurry pictures. But a professional wedding photographer has done this – many times. They know how to deal with this – they will give you well lit, sharp, in focus and beautiful pictures. They know what to shoot, when to shoot it and HOW to shoot it. Because this is their job – they have done this, they know how to deal with it! You put so much into making this day perfect. Don’t cheat yourself out of the chance to have beautiful memories of your beautiful day. Your marriage and your pictures. Those are the only things that last beyond the wedding. Make sure your pictures will capture just how incredible the day actually was, so you can cherish those memories forever! We would LOVE to be your wedding photographers! Our prices start at $1000 for a full days coverage (and that INCLUDES a second photographer and an engagement shoot). Dont hesitate to contact us at http://www.robmorrisphotography.com/contact/ for more information! Traditional weddings have a very basic "formula" they follow on the day of the wedding: the bride and groom get ready in separate rooms, the ceremony starts, the groom finds himself waiting up at the altar for his bride. He has not seen her yet. She has spent HOURS getting ready, getting beautiful - getting perfect! The groom hasn't seen the woman he loves - the woman he is going to spend the rest of his life with - all day. When he does see her, she will look unlike he has ever seen her before. It's a pretty intense moment! Then the ceremony proceeds, and in between the ceremony and the reception, the bride, groom and wedding party (and often various members of the family) go with the photographer and take pictures. But the formula doesn't always happen that way. For one reason or another, the formula has to go (and that's perfectly fine), and it becomes unavoidable that the groom will see his bride before the ceremony. Along those lines, a new tradition has developed over the last few years (decade?) called "the first look." In short, the groom is put in a spot facing a specific direction and told he can't turn around until the photographer says so. In a sense, this entire moment is about the groom. He has something the bride wants - something she has spent all day to this point preparing for and looking forward to: his reaction to seeing her in her wedding dress on their wedding day. And the reaction is virtually guaranteed to be great! He has spent all day apart from the woman he loves - and looking forward to seeing her - and when he finally gets to see her for the first time that day he is usually about ready to burst... and the "first look" is a truly emotional moment for the couple. This is a picture of Jonathan Bowman waiting as his bride, Jasmine, walks up behind him. The look on his face is great! Notice his hands - he was so excited that he was having trouble standing still - he fidgeted with his hands a lot (which was great!) I have many pictures of this entire event (the First Look), and the pictures before he turned around show his excitement! He couldn't wait to see her - and even though the focus is on him in this shot (I intentionally had Jasmine out of focus in this shot), her smile can't be hidden - she couldn't wait for him to see her either! First looks are great, it's a very recent tradition, and a very good one!